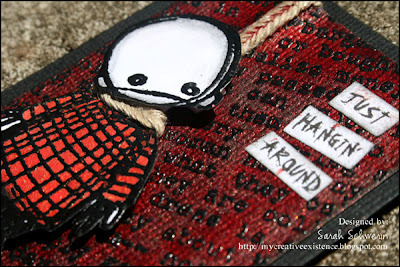 One day whilst blog surfing, I came across this cool ATC project on Carol's blog. I'm a big fan of the gothic style stamps from Penney/Torrente at Stampotique and I love trading ATC's so it was a no brainer to want to make one of those awesome little ATC envelopes of my own! As soon as I saw it, I knew that it would make a great swap project, and I knew that fellow Stampotique lover, (and regular at Inkurable Stampers), Vicky Fernando, was just the person to swap it with! So, we agreed on 5 ATC's inside the pocket, and I set us a deadline - by the end of June - and we weren't allowed to post it until the other person was finished. Well, to cut a long story short, Vicky finished on time, and I got busy with one thing or another and left poor Vicky hanging!! So now, 4 months late (OMG!! ), I actually got mine finished last weekend and sent it off! LOL!! I used Becca's great tutorial for my ATC Envelope, and customised it a little. 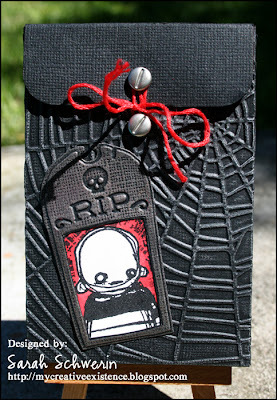 I used black Bazzill cardstock for the envelope, and embossed it with a Spiderweb Cuttlebug Embossing folder. To highlight the web, I buffed over it with silver Metallic Rub-ons - hadn't used them in years! LOL!! The Tombstone is a Cuttlebug diecut/embossing combo. Again I used black bazzill cardstock, and this time I sued a combination of colours of Metallic Rub-ons to colour it. I cut out the rectangle, and added the image behind it. That stamp is called "Rocky" and I stamped him onto white cardstock using black ink, then coloured around him with Barn Door distress ink using an Aquash pen. I then stamped a grunge background stamp (by Kaisercraft) around his head. The flap is held closed by 2 screw brads tied together with some red thread. On the inside of the flap I've used some gorgeous paper that has a velvet damask print on it - very decadent! So, inside the pocket goes 5 ATC's. I'll share each of them here, so brace yourselves - there's lots of pics! LOL! 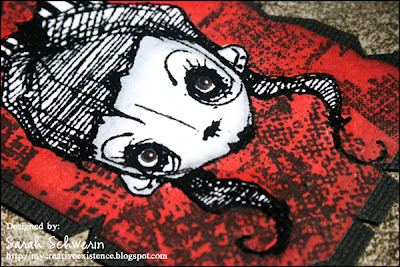 The name of the main stamp I used here is "Miss Snottie". 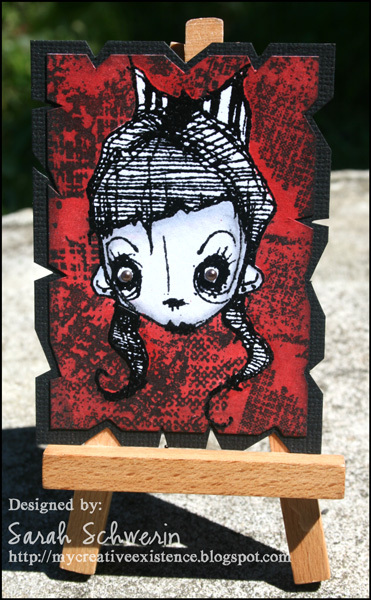 I stamped Miss Snottie onto white cardstock using black ink, and then heat embossed her with black embossing powder. I masked Miss Snottie and coloured the background using Barn Door Distress ink and a foam blending tool. 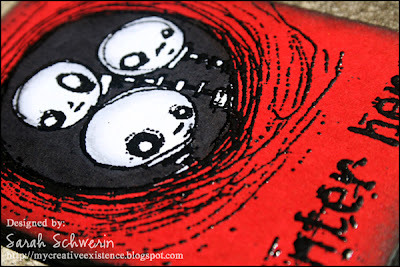 I then stamped over the background with the Kaisercraft grunge background stamp in black ink before removing the mask. To give some definition to her face, I added in shadows using Copic Markers (C-1 and the clear blender), and used Kaisercraft pearls for her eyes. I used a Scrapmatts ATC background (a thick piece of card with a white front and bevelled edges. Not sure if they still make these, but I picked them up at a craft show years ago) for this one. First I stamped the "3 in a round" directly onto the white surface using black ink, and heat embossed with black embossing powder. I then stamped and heat embossed "Enter Here" (from the Darkroom Door Gothic Arches set) the same way at the bottom of the ATC. I masked off the main image, and coloured the background using Barn Door Distress ink and a foam blending tool. Again, I added highlights to the skulls using the C-1 Copic marker and a colourless blender. The edges of the ATC were inked with black ink, and the background behind the skulls was coloured using a black Copic marker. 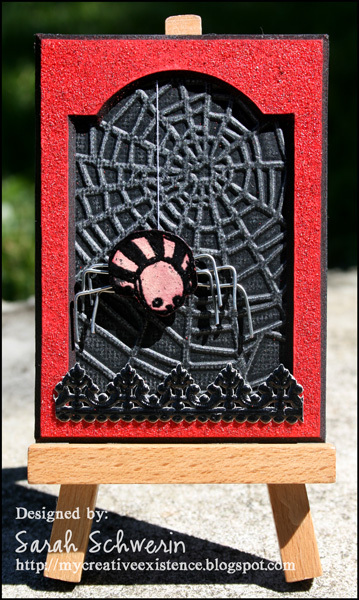 For this ATC I created the background using black bazzill cardstock and the spiderweb Cuttlebug embossing folder. Just like the pocket, I used Metallic rub-ons to highlight the raised surface of the web. 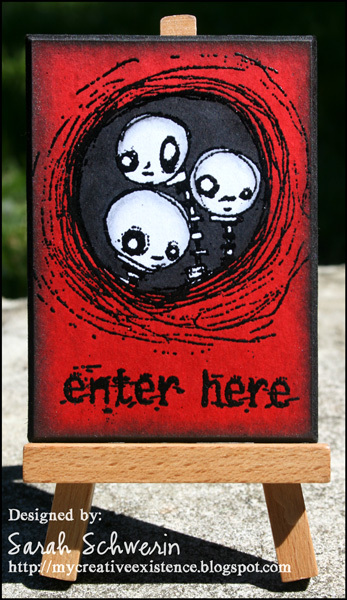 Mr Stripes (the spider) was stamped onto red cardstock with black ink and heat embossed with black embossing powder before being coloured using bleach. Because the legs were way to fiddly to cut out, I just cut out the body and used wire for the legs. A piece of white cotton was used for the strand of web that he hangs from, and he s stuck to the ATC using foam mounting tape. The red frame is another ATC shape from Scrapmatts. I inked it with Barn DOor distress ink and embossed it with Fired Brick Distress Embossing powder which has a wonderful rough texture once set. When I placed the frame over the ATC Background I realised that it looked a bit like a tombstone. A bit of German Scrap border at the bottom finished off the look! OK - getting a bit darker now! LOL!! The base is black bazzill cardstock and the background is white cardstock onto which I stamped the text stamp (from Stampotique) in black ink and heat embossed with black embossing powder. This acted as a resist when I coloured the background using Twinkling H2O's (Cinnamon). I gave it a few layers and the result is a cool blood like effect that is nice and sparkly! The edges were stitched with some red embroidery thread. That poor little guy is called "Head" and I stamped him onto white cardstock in black, heat embossed, and coloured his jumper with orange Twinkling H2O's. To get the noose to look right, I had to chop off his head and attach it at an angle once the rope had been wrapped around his shoulders and up to the top of the ATC. The red on the rope was accidental - just a consequence of the glue mixing with the H2O's on the background! He's attached to the ATC with foam mounting tape. Again, I used the Copic markers to create a shadow around his face. The words were printed using my computer. Again I used a Scrapmatts ATC background. I coloured it with Twinkling H2O's, using more of a dripping effect this time. I stamped "Mink" onto the background using black ink and heat embossed using black embossing powder. 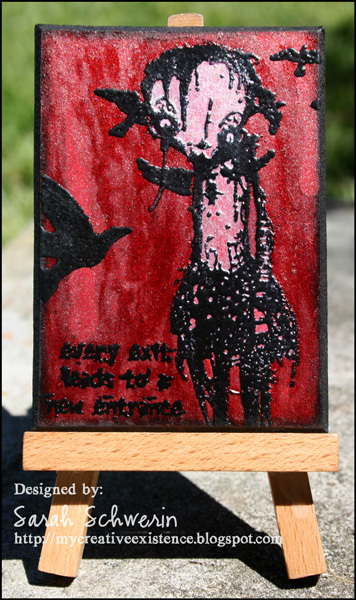 I masked over her, and then stamped the Tim Holtz flying crows stamp and heat embossed. I also stamped and heat embossed the quote (again from the Darkroom Door Gothic Arches stamp set) at the bottom. In case you can't read it, it says "Every exit leads to a new entrance". Mink was coloured using a pearly white Twinkling H20 applied with an Aquash pen. Phew! That's it! Are you still with me??! LOL! So there you have it - probably not everyone's cup of tea, but I had heaps of fun making it and Vicky loved it!! OH WOW sarah i love your ATC's. As you can tell ive given up on most things creative due to the missing mojo. Love looking at your work. I LOVE your ATCs and their holder, the red and black look so great together. These are awesome Sarah! Every time you post a project using these Stampotique stamps, it costs me money! Not this time tho - I already own all of these LOL. Thanks for sharing. OMG Sarah - they're stunning! 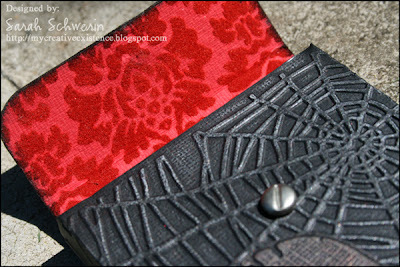 I'm definitely going to have to get the spider's web embossing folder. There are so many different elements and techniques you've used to create a fab cool project. I really love your poor little hanging Head. Brilliant! Oooooooh Sarah, that ATC envelope is absolutely gorgeous. I tried to order that spiderwerb embossing folder last week, but it was out of stock (again). Love all of your ATCs, that colourcombo is so powerful! 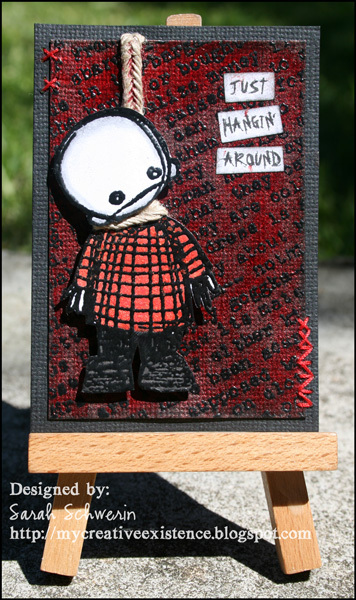 I secretly envy Vicky and I'm dying to see the ATCs she sent you! OMG Sarah! 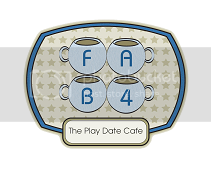 Love your atc`s and the cute envelope! I WANT ONE! My fave would have to be Mr Stripes in the tombstone. 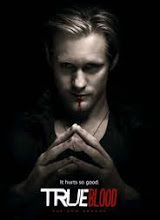 Can`t wait to see Vicky`s! these are all AMAZING! every stinkin' detail is so clever! the red and black is such a cool combo together! beautiful art! whew..I am still with you...wow, what gorgeous ATC´s...and that little envelope...really cool!